Michael Kaplan at the New York Post offers a piece on the law enforcement agent portrayed in the film The Infliltrator. In the 1980s, Staten Island native Robert Mazur was hired to launder over $100 million for some of the world’s largest drug-trafficking syndicates. Underworld kingpins, who knew him as Bob Musella, considered him family. But there was one thing they did not know: The money-mover was an undercover agent for the US government. “I got my high from obtaining information that nobody else could get,” Mazur, now in his 60s, tells The Post. 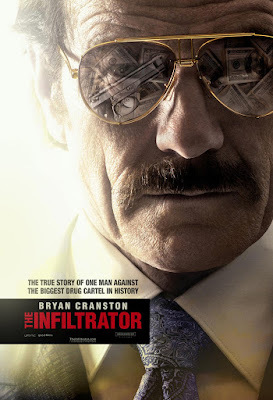 His exploits — which resulted in more than 100 indictments, in excess of 3,000 pounds of cocaine confiscated, and seizures and penalties that exceeded $500 million — form the basis of “The Infiltrator,” starring Bryan Cranston as Mazur and opening in movie theaters on Wednesday.